(Washington, DC) – Judicial Watch today released 276 pages of internal State Department documents revealing that within two days of the deadly terrorist attack on Benghazi, Mohamed Yusuf al-Magariaf, the president of Libya’s National Congress, asked to participate in a Clinton Global Initiative function and “meet President Clinton.” The meeting between the Libyan president and Bill Clinton had not previously been disclosed. The documents also show Secretary of State Hillary Clinton’s staff coordinated with the Clinton Foundation’s staff to have her thank Clinton Global Initiative project sponsors for their “commitments” during a Foundation speech on September 25, 2009. The Judicial Watch documents were obtained as a result of a federal court order in a Freedom of Information Act (FOIA) lawsuit filed against the State Department on May 28, 2013, (Judicial Watch v. U.S. Department of State (No. 1:13-cv-00772)). The State Department apparently had no objection to the meeting, because on September 26, Desai emailed Mills, “He had a v good meeting with Libya …” Hillary Clinton and al-Magariaf did not have a meeting until September 24. The State Department material includes background information made by Clinton Foundation partners, which include Foundation donors Nduna Foundation, Grupo ABCA, and Britannia Industries. Other CGI partners noted in the State Department documents include a federal agency (the Centers for Disease Control) and various United Nations entities, which also receive U.S. taxpayer funds. And so I congratulate all who helped to put on this (inaudible) CGI [Clinton Global Initiative]. I especially thank you for having a separate track on girls and women, which I think was well received for all the obvious reasons. (Applause.) And this is an exceptional gathering of people who have made exceptional commitments to bettering our world. 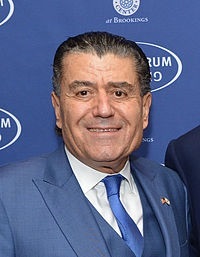 Haim Saban, a top Clinton donor, sought to entice Bill Clinton into to travelling to Damascus in 2009 to meet with a high-level Syrian delegation. The meetings were part of the Saban Forum. Evidently, the trip never took place. This lawsuit had previously forced the disclosure of documents that provided a road map for over 200 conflict-of-interest rulings that led to at least $48 million in speaking fees for the Clintons during Hillary Clinton’s tenure as Secretary of State. Previously disclosed documents in this lawsuit, for example, raise questions about funds Clinton accepted from entities linked to Saudi Arabia, China and Iran, among others. Judicial Watch’s litigation to obtain these conflict of interest records is ongoing. The State Department has also yet to explain why it failed to conduct a proper, timely search in the 20 months between when it received Judicial Watch’s request on May 2, 2011, and the February 1, 2013, date Secretary Clinton left office. Links to the full production of documents can be found here. Veröffentlicht am 22. April 2016 in Deutschland heute Abend, Tagesthemen und mit 160 Mio Exklusiv TV Vertrag Kirch, Blackrock Dreyfus Hildebrand Adidas hoeness, Clinton buys Twitter account, Clinton Email Gate, Clinton Foundation, Clinton Kirch Infront Haim Saban, Der George Soros vom Tegernsee Die irrsten Zahlen im Hoeneß-Prozess: Er setzte 150 Millionen gegen den Dollar, Der Kirch- FIFA Vertrag für die WM 2002 und 2006. Bestechungsgeld-Konten FIFA Funktionär. Ein Konto bei der Vontobel Bank ist auch darunter!, derblauweisse, Dreyfus Hoeneß Kirch Infront FC Bayern #FCB, Dreyfus Kirch Infront isl Korruption FIFA, George Soros, Haim Saban, Hain Saban, Hillary Clinton is a Republican, Jörg Selan, Oligarchen Netzwerk getaggt. Setze ein Lesezeichen auf den Permalink. Hinterlasse einen Kommentar.